As a blogger, a big part of what makes my blog happen is my Instagram. It’s my largest following and generates a lot of my business. I had been struggling for a while with how to increase my traffic from my Instagram and convert it over to my blog where people can see ALLL of my content instead of just the outfit shots. 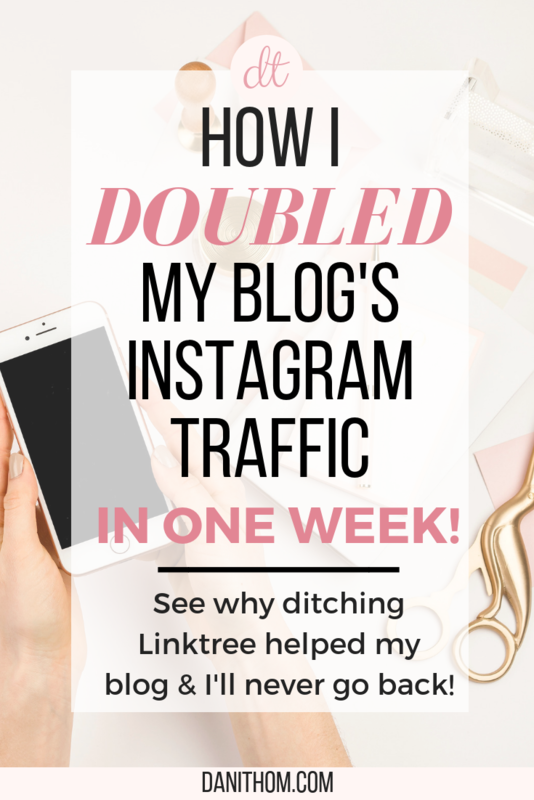 The way most bloggers have things set up is with Linktree, a linking service that lets you take the most advantage of the ONE profile link you can have in your Instagram profile. But one link doesn’t do much for me if I want to be able to talk about and promote multiple things at once and not have to change the link every day! Sometimes people find my posts via hashtags a few days later, so that would do them no good. The sad truth is, not many people will want to actually search for the information if it isn’t already there, readily available. Once their interest is piqued, you have to deliver quickly and make it as easy as possible. 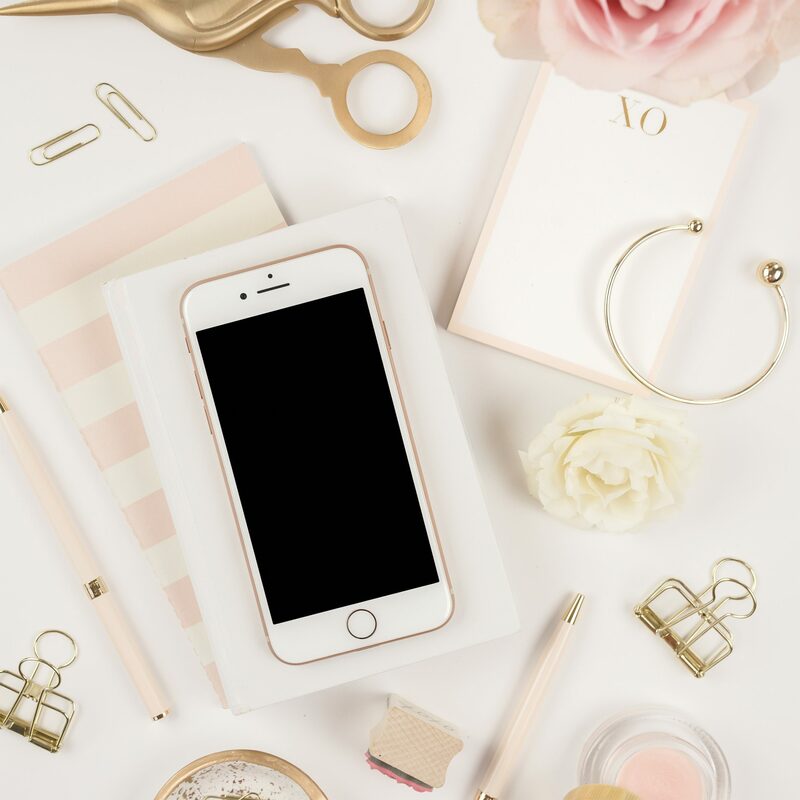 I get a fair amount of traffic from Instagram, but I also knew it wasn’t near where I wanted it to be, and part of my 2019 goals is to get better at converting more of my IG family over to my blog (so they can get all the good stuff!). I recently decided to play around with my link and see what kind of difference it made. First I tried just linking to my “shop” page, as that’s the most common thing people click for. But what about the other posts I’m telling my followers to look at? All of my blog posts I want to promote? I also personally noticed a few issues with Linktree. It was very helpful for the time I used it, but sometimes the links don’t work and it gives an error message when my link was perfectly fine. So that lost me some traffic. There were also a few times people would click the link and a popup would stop them saying “you’re about to leave Instagram, click to continue”, which could also kill my traffic as people look at that and think “Ok, what is this link leading me to if I’m being warned about leaving Instagram for it?”. When I thought about all this, I decided I should just make my OWN landing page. So I did. And the result was EXACTLY what I wanted! My traffic DOUBLED. Think about all the people that just click the Linktree link in your profile. That takes them to that specific landing page. Those are WASTED CLICKS! They’re going to a middle man site, when they could be going directly to your blog. Well now, it DOES bring them directly to my blog to a page I created just for Instagram. My own landing page. Once they get to that page, they can click one of the “buttons” I made, or just look around on their own. But they’re already here, where I want them to be! Now, I’ll walk you through how I did this; it’s SUPER easy! First, create a new page on your blog. I named mine “Instagram Links”. You can name it whatever you want, but think about it because that link will be what stays in your profile! Next, I used Canva to make my buttons. Really they’re just pictures with links, but they look like buttons. People LOVE to click buttons. You can also change this up and use pictures, featured images or whatever you want. I used buttons because as a lot of my Instagram traffic is from Mobile phones, I wanted more to show up on the screen at a time. In Canva, I did custom dimensions and used 800 x 100 for my buttons. I used my typical color scheme and font to maintain my branding. Once they were done, I downloaded them all and uploaded them as a separate area on the page. In the new WordPress (it’s weird, y’all, I’m still not used to it), you can create sections, as shown below. 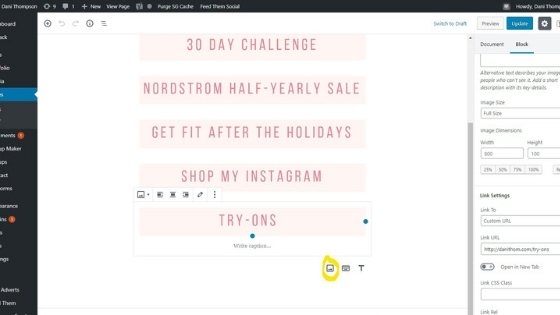 Click the “image” option (highlighted). I put each image as its own “section” so that I could change or delete them and move them up and down easily. Once I uploaded all of the pictures, I went over to the side in the Block section, and toward the bottom, it says “Link Settings”. Where it says “none” click that and a drop down comes up. Select “custom URL” and paste the corresponding link in there. Do this for all of the “buttons”. 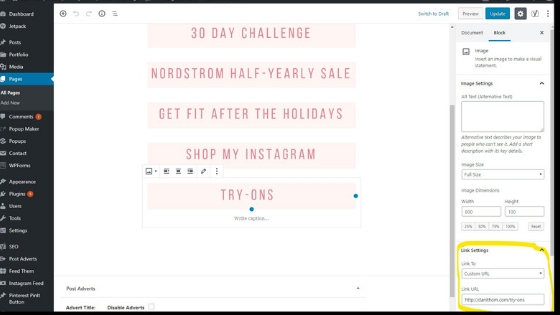 Once you’re done, hit Publish and copy that link into your Instagram profile! Now all of those clicks that were directing people elsewhere are directing them RIGHT to your blog where you can share as much knowledge as you have to offer with them! Hopefully you find this as helpful as I did and can take full advantage of all those extra clicks!! I’m so glad you found it helpful Zarina!! Thank you for reading! This is a great idea – one I hadn’t thought of doing before but so much better than my linktree. I’m definitely going to be working on this this weekend! Thanks for sharing!! I’m so glad it helped and hopefully has the same results for you!! This is so good! Love how easy you did this and how you explained every step! I know my next project for sure!! So good!! Aw thank you Renee!! I want everyone to be able to use this and benefit like I did! Thank you for posting this step by step tutorial. I followed all of your steps and custom created my own link-tree 🙂 It was so easy. That’s fantastic, I’m so glad!! Thank you for reading! This was SO helpful. I love this idea. I have gone back and forth with Linktree but this seems like a better longterm solution. Thank you. I’m so glad you found it helpful!! I went back and forth, too, but no need for the middle man anymore!